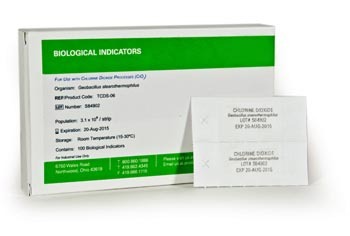 Biological indicators provide repeatable, reliable evidence of a successful sterilization cycle. For chlorine dioxide sterilization cycles, biological indicators are chosen with 106 (that's 1 million!) Geobacillus stearothermophilus spores inoculated on paper strips and wrapped in tyvek for their high resistance to the chlorine dioxide decontamination process. ClorDiSys features NAMSA biological indicators for the highest standard of repeatable and consistent results. Biological indicators can be used for initial validation or as part of ongoing cycle verification procedures. Biological indicators can be placed out in the open or in more challenging areas to test the distribution and penetration properties of CD gas. Visit our Biological Indicators Page to view successful challenge areas and learn about the full power of sterilization with chlorine dioxide gas. ClorDiSys' BIs' rapid incubation time provides quick results and minimizes downtime so you can be back up and running in no time after a decontamination. If growth of a BI does occur upon incubation, the incubation media will change color due to a natural pH change, making it easy to distinguish positive and negative results. Organism type, lot numbers and expiration dates are printed on each strip for traceability and verification that proper strips are being used.